I am honored to serve as your District Governor for the 2018/19 Rotary year. I look forward to working with you and being an inspiration through Rotary. 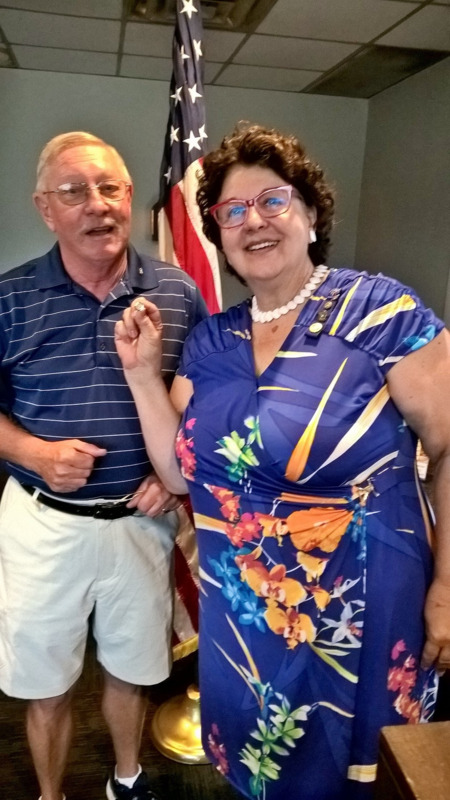 Let's thank Immediate Past District Governor Una Martone for her leadership during the 2017-18 Rotary year. What an outstanding year it was! Many of us recently returned from the International Convention in Toronto where we heard many inspirational speakers and met Rotarian friends from all over the globe. A number of the keynote speakers’ presentations were recorded and are available by clicking here. I encourage you to take time to watch the videos. They are informative and inspirational. One, which I found very interesting, was a presentation by Marie-Paule Attema, a Rotary Peace Scholar who was a young girl in Rwanda during the time of the genocide. This is an example of Rotary Foundation dollars at work. There was also an update on the eradication of polio from Dr. Tedros Adhanom Ghebreyesus, Director-General World Health Organization. He reported that last year there were 22 cases of polio in 2 countries, Afghanistan and Pakistan. This year the work will continue in Nigeria and hopefully it will be the next country declared polio free. In the closing session, Barry Raskin, 2018/19 RI President, said the beginning of everything in Rotary is INSPIRATION. INSPIRATION to make the world a better place, to make the future better for our children and to give hope to those we will never meet. Each of us needs to be INSPIRED by what we can accomplish together and be the agent for change in our clubs, our communities and around the world. 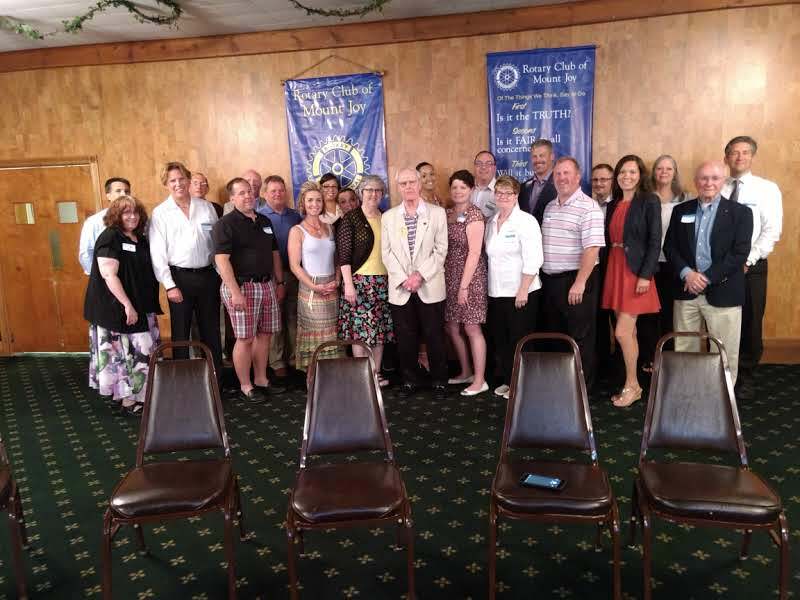 Northern Lebanon Rotary Club President Melanie Ann Schaeffer M.F.A. handed over the gavel to incoming president Nigel Foundling. As Melanie began her year as President, she announced that she would dedicate the 2017-18 Rotary year and our service to Charter member Ruth Deitz who served as an inspiration and role model to all. Ruth exemplified “Service Above Self”. We must ask ourselves if we took up the mantel. 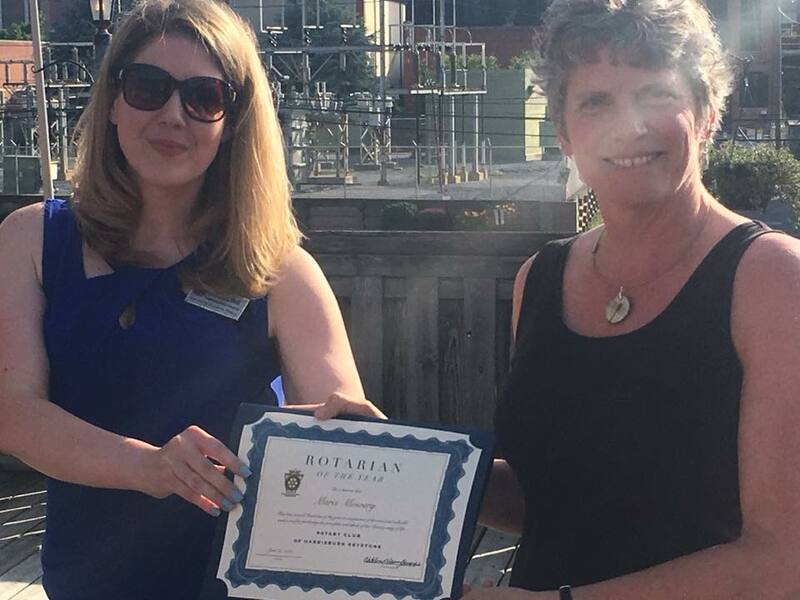 As Melanie reviewed her year, she saw much the Northern Lebanon Rotary Club did to serve the Community and the world at large. Mount Joy’s Rotary Clock has been removed from its downtown location. Where did it go? Off to Lititz where watch and clockmaker Bob Desrochers is currently refurbishing it. The timepiece will be returned in good working order by the end of summer. Look for a special ceremony bringing this landmark back to the hub of Mount Joy. 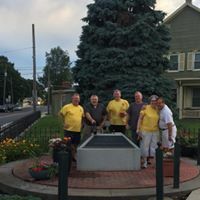 Taking advantage of the clock’s temporary vacancy, the corner of Marietta Avenue and Main Street has been re-landscaped by the Rotarians who regularly meet at Bube’s Brewery on Thursday evening, the Club’s new alternate meeting site. Pictured above are Rotarians: Greg Sallade, Jack Garner, Dave Christian, Gary Ebersole (special guest), Cris Rhyner and Tim Melhorn. While most of the funds for cleaning, repairing, and repainting the clock were raised this spring under the direction of Randy Wolgemuth, the Club needs an additional $2,500 to meet the refurbishment costs. 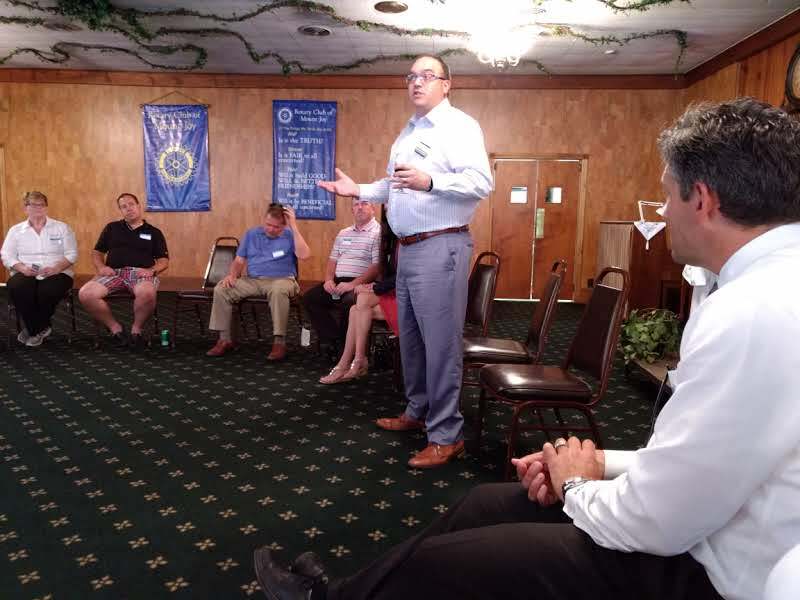 To address the shortfall, the Rotary Club of Mount Joy will be offering hot, delicious fries, hot dogs and cold beverages at Mount Joy Chamber of Commerce’s Music in the Park events on July 29 and August 5. Find the Fry Wagon at the corner of Delta and Marietta Avenue and help bring back the clock! The Rotary Club of Mount Joy ably led by President Joanne Pinkerton hosted a wonderful RMB networking event on Thursday, June 28 at the Gathering Place, Caterers, Mount Joy, PA with 24 Rotarians and guests attending from the following 10 clubs: Carlisle, Colonial Park, Elizabethtown, Hanover, Harrisburg, Harrisburg Keystone, Hershey, Lancaster, Lancaster Penn Square, Mount Joy. 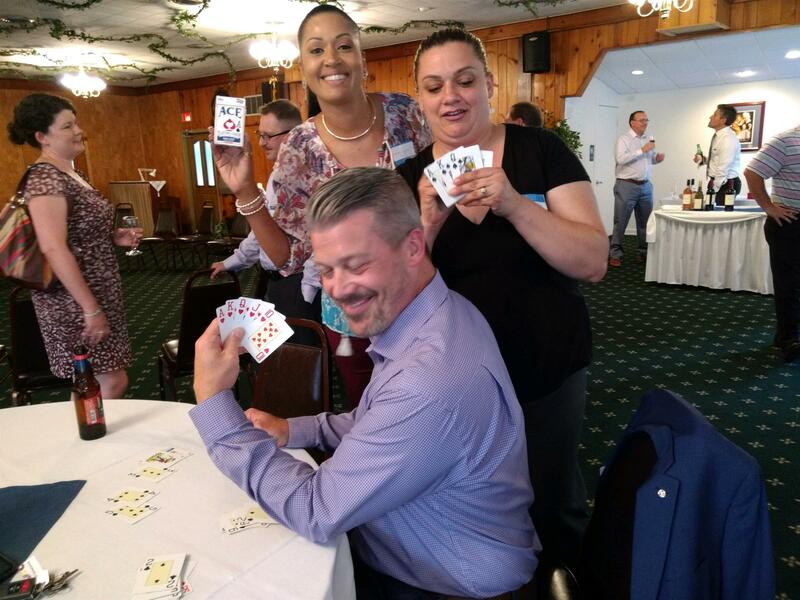 Event sponsors included District 7390 RMB (provided a dollar grant), Randy Wolgemuth of Koser Jewelers (provided the adult and soft beverages), and Joanne Pinkerton of The Gathering Place Caterers (provided the best spread of delicious foods ever). All of these sponsors made possible a free event. Thank you sponsors! Another noteworthy aspect of the event was the number of young Rotarians or young about-to-be Rotarians that attended and made the event even more friendly and full of fun and fellowship. Additionally, many great connections were made.